Origin of life : G. Cardozo and J. F. Fontanari, Eur. Phys. J.55 (2006) 555. Biological control systems : K. Kiyono, et al., PRL95 (2005) 058101. Plasma physics : C.A. Knapek et al. Phys. Rev. Lett 98 (2007) 015001. Meteorology and Climatology: O.Petres and D. Neelin, Nature Phys. 2 (2006) 393. The concept of self-organized critical (SOC) phenomena has been introduced some time ago to explain the frequent occurrences of scaling laws experienced in nature. The term SOC usually refers to a mechanism of slow energy accumulation and fast energy redistribution, driving a system toward a critical state. The prototype of SOC systems is the sand-pile model in which particles are randomly dropped onto a two dimensional lattice and the sand is redistributed by fast avalanches. Therefore in SOC models instead of tuning the parameters an inherent mechanism is responsible for driving it to criticality. SOC mechanism has been proposed to model earthquakes, the evolution of biological systems, solar flare occurrence, fluctuations in confined plasma, snow avalanches and rain fall. Rough surfaces and interfaces are ubiquitous in nature and from technological point of view the control of their roughness is becoming critical for applications in fields such as microelectronics, image formation, surface coating or thin film growth (see example: T. S. Chow, Mesoscopic Physics of Complex Materials Texts in Contemporary Physics, Springer 2000). During the last years there has been an interest in the description of of the self-affine kinetic roughening of surfaces, the micro structure (see: "A. Yanguas-Gil et al. ,Phys. Rev. Lett, 96 (2006) 236101). Related topics are the depinning transition of elastic systems in disordered media (A.B. Colton et al., Phys. Rev. Lett. 97 (2006) 057001) and the wetting transitions (F. Ginelli et al. J. Stat. Mech. P08008 (2006)). In application to parallel and distributed computations, the important consequence of the derived scaling is the existence of the upper bound for the desynchronization in a conservative update algorithm for parallel discrete-event simulations (A. Kolakowska et al. Phys. Rev. E 70 051602 (2004)). Earlier most of the models were investigated on regular lattice type of systems (approximating a smooth field theory by continuum limit). This is because lattice realizations are simpler than in continuum space, e.g., they sometimes allow for exact results and are easier to be implemented in a computer. Furthermore, a bunch of emerging techniques may now be applied to lattice systems, including nonequilibrium statistical field theory. A general amazing result from these studies is that lattice models often capture the essentials of social organisms (T. Antal et al. Phys. Rev. E 64 (2001) 036118), epidemics, glasses (C. Chamon, Phys. Rev. Lett. 94 040402 (2005)), electrical circuits, transport (Ez-Zahraouy et al., Chin. J. of Phys. 44 (2006) 486), hydrodynamics (J. Marro et al., Phys. Rev. E 73 (2006) 184115), colloids, computational neuroscience (L. S. Furtado, M. Copelli, Phys. Rev. E 73 (2006) 011907) or botany (K. A, Mott, D. Peak, Annals of Botany 1-8, (2006). In the past few years the interest is focused on the research of complex networks (R. Albert and A.-L. Barabasi, Rev. Mod. Phys. 74, 47 (2002). Recently the dynamics and the phase transitions of network systems is under study (M. Aldana and H. Larralde, Phys. Rev. E 70, 066130 (2004)). Contrary to the regular lattices universality in network models is not so well defined, scaling (if exists) depends on the underlying topology ,,,,[73 ]. (a) Systems which do have a hermitian Hamiltonian and whose stationary states are given by the proper Gibbs-Boltzmann distribution. However, they are prepared in an initial condition which is far from the stationary state and sometimes, in the thermodynamic limit, the system may never reach the true equilibrium. These nonequilibrium systems include, for example, phase ordering systems, spin glasses, glasses etc... and are defined by adding simple dynamics to static models. (b) Systems without a hermitian Hamiltonian defined by transition rates, which do not satisfy the detailed balance condition (the local time reversal symmetry is broken). They may or may not have a steady state and even if they have one, it is not a Gibbs state. Such models can be created by combining different dynamics or by generating currents in them externally. The critical phenomena of these systems are referred here as ``Out of equilibrium classes''. There are also systems, which are not related to equilibrium models, in the simplest case these are lattice Markov processes of interacting particle systems (T. Ligget, Interacting particle systems (Springer-Verlag, Berlin, 1985)). These are referred here as ``Genuinely non-equilibrium systems''. 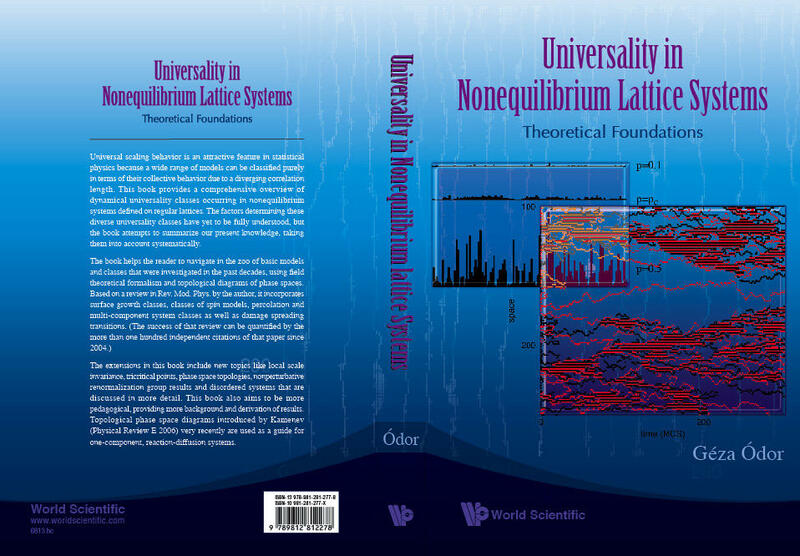 Universality classes in nonequilibrium lattice systems Rev. Mod. Phys. 76 (2004) 663.